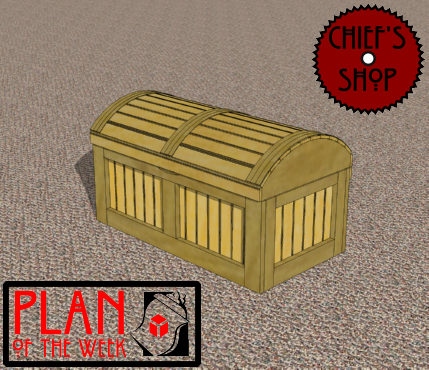 The Chief’s Shop Pirate’s Chest Toy Box can be enjoyed by young and old alike. It’s made via very simple construction, even with the curved top. A perfect Christmas present, it can be enjoyed through childhood and still be useful when he or she leaves the nest. Overall dimensions: 32 inches wide x 17 inches deep (at the base) 17 3/4 inches deep (at the lid): 17 13/16 inches high.